In this paper, the TeMo5O16 ternary and MoO3-TeO2 binary compounds were prepared by using the solid-state reaction method and with MoO3-TeO2 oxide precursor solutions. The effect of pH and annealing temperature on the structure especially formation of TeMo5O16 ternary phase and optical properties of nanoparticles have been investigated. Ammonia (NH3) and nitric acid were used to adjust low and high pH, respectively. 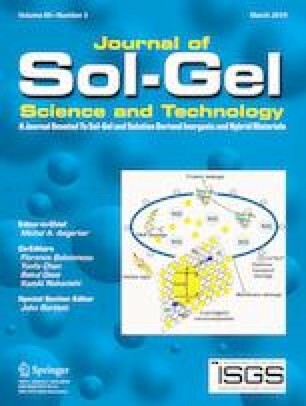 Synthesis and the formation of TeMo5O16 ternary compound were carried out at two processes: (A) chemical reduction with NaBH4 under nitrogen atmosphere and (B) annealing at temperatures T = 350 °C and 400 °C in air. These two temperatures were chosen because of the proximity to Te’s melting point. The results of X-ray diffraction showed that with increasing the annealing temperature, the MoO3-TeO2 binary composition is increased and an additional Te2O5 phase is observed. Also, with decreasing pH, the TeMo5O16 ternary phase is increased. 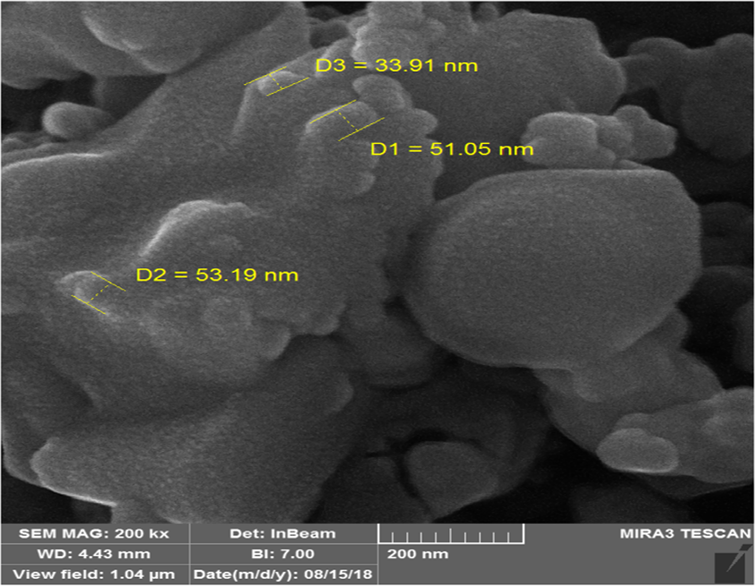 The field emission scanning electron microscope (FE-SEM) images showed that the morphology of the nanoparticles is sphere-like, polyhedral forms, which indicates the presence of particles in different phases. The UV–Vis spectroscopy results showed that the energy gap of nanoparticles is varied in the range of 2.83–2.94 eV. The bonding structure of nano-particle was also studied by FT-IR spectroscopy. The XRD pattern of synthesized samples in different pH at annealing temperature T = 400 °C: (a)- pH = 2, (b) pH = 5, (c) pH = 8 and (d) pH = 10. The TeMo5O16 ternary and MoO3-TeO2 binary compounds were prepared by solid-state reaction method. 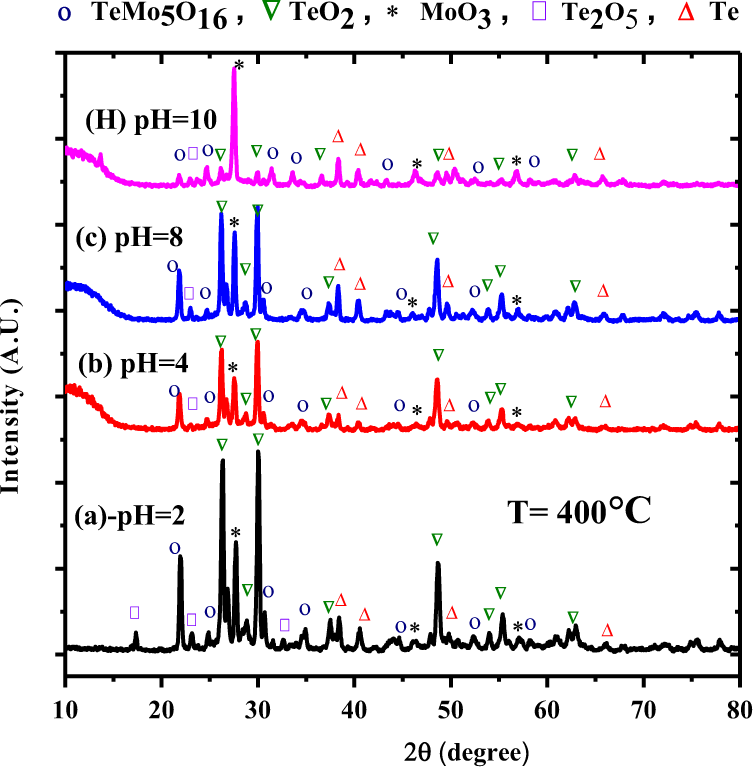 Effect of pH and annealing temperature on TeMo5O16 ternary phase formation has been investigated. Synthesis and the formation of TeMo5O16 ternary compound were carried out at two processes. With increasing the annealing temperature, the MoO3-TeO2 binary composition is increased. With decreasing pH, the TeMo5O16 ternary phase is increased.